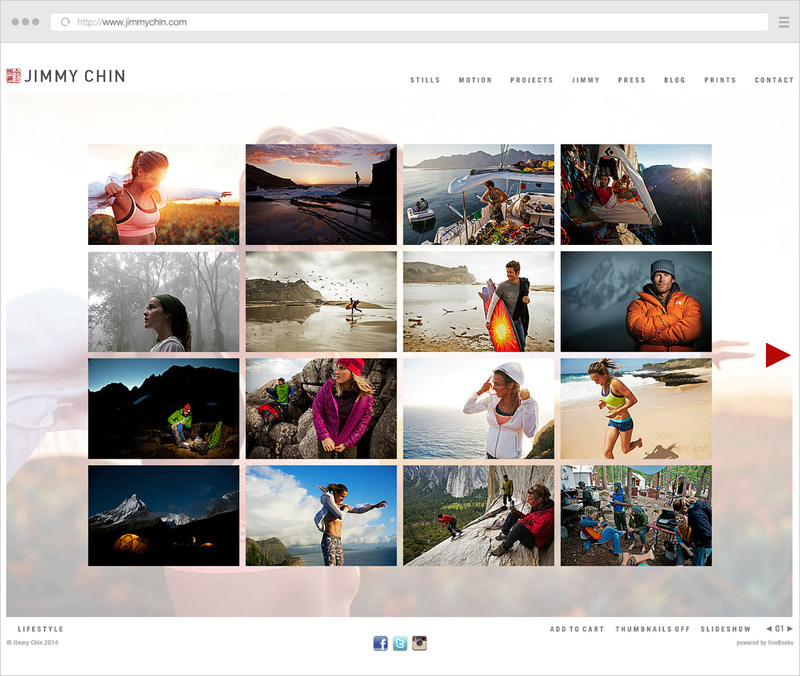 Your photography website is the foreground of your business, it’s the first point of contact for fans or buyers. Even though every photographer envisions his/her website differently, some details should always be there. Having worked with many photographers, I’ve noticed patterns in the way great websites are built and what contributes to their success (and try to always do the same in my work). 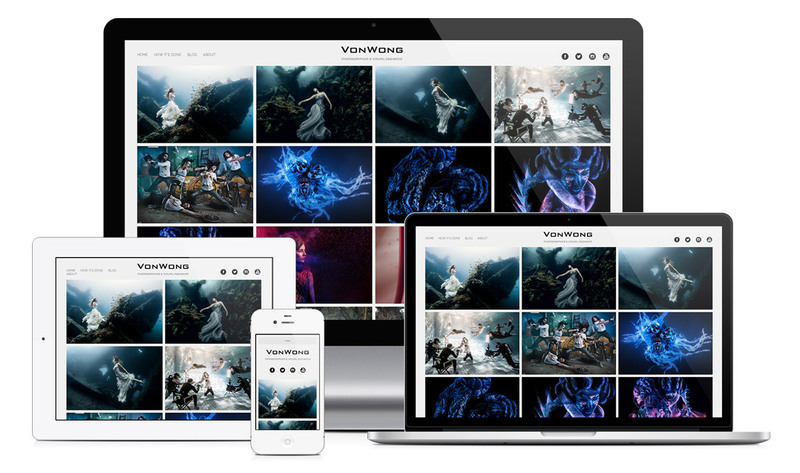 To help move you forward with your photography business goals and create an appealing website, I’ve compiled a list of 15 traits of successful photography websites. They’re valid regardless of whether you’re just starting out & looking for some guidance or simply need a site refresh. Successful photographers have understood the value of simplicity, of focusing on the essentials and removing the superfluous. So even if you have a lot of content on your site, you should try to organize it in a simple way, to not confuse people and tempt them to leave the site. Attaining a good level of simplicity (without sacrificing usability) is really tough! 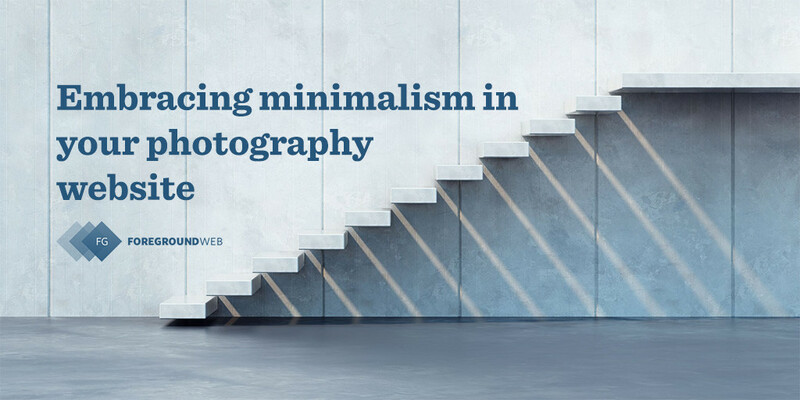 Since many photographers struggle with this, I’ve tackled the topic separately in a detailed article here: Embracing minimalism in your photography website. Simplicity helps you prioritize the important things, and it creates a better browsing experience for your users. You have to learn how to thoughtfully limit your visitor’s choices and try to guide them through the site, to simplify your navigation & graphics, and to only emphasize the essential elements on the page. On Michael‘s website, nothing distracts your from the great intro images, there are no annoying splash pages, pop-ups, weird background colors, over-crowded elements or any “fluff” like that. 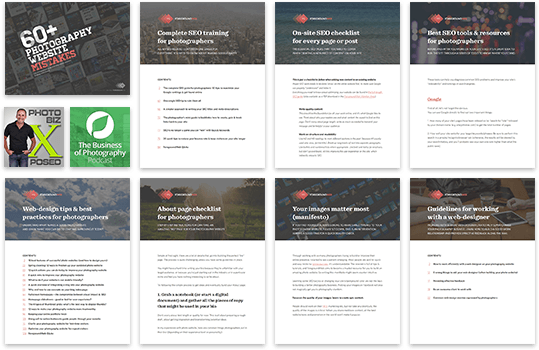 You’re just getting a clear browsing experience: straightforward navigation and clear calls to action. Photographers are sometimes overly-concerned with the visual aspects of the site, at the expense of usability. 83% of visitors leave a website because it takes too many clicks to get to what they want, that’s a huge number! 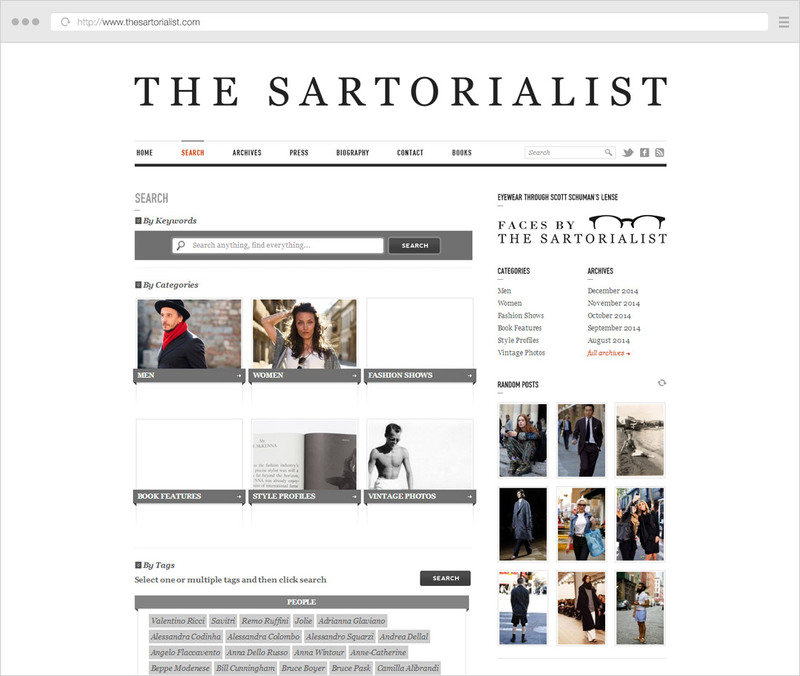 The “Search” page on “The Sartorialist” provides a wealth of searching and filtering options. 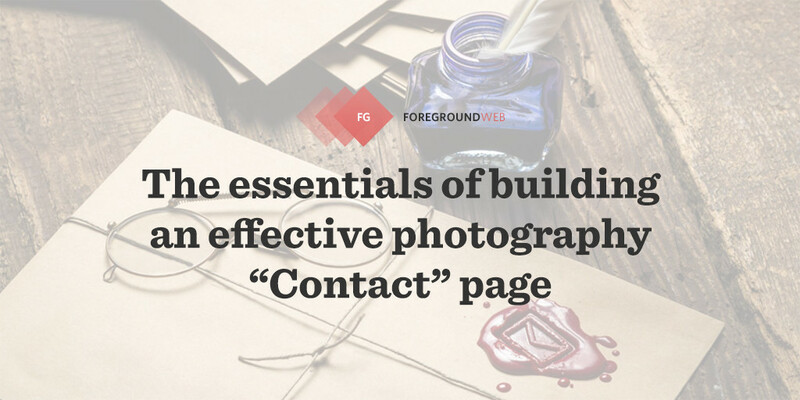 If I were to choose just a couple of advice to share with all photographers out there, it would be to make your contact info as easily accessible as you can (including in the footer on every page), and to simplify the contact form as much as possible. 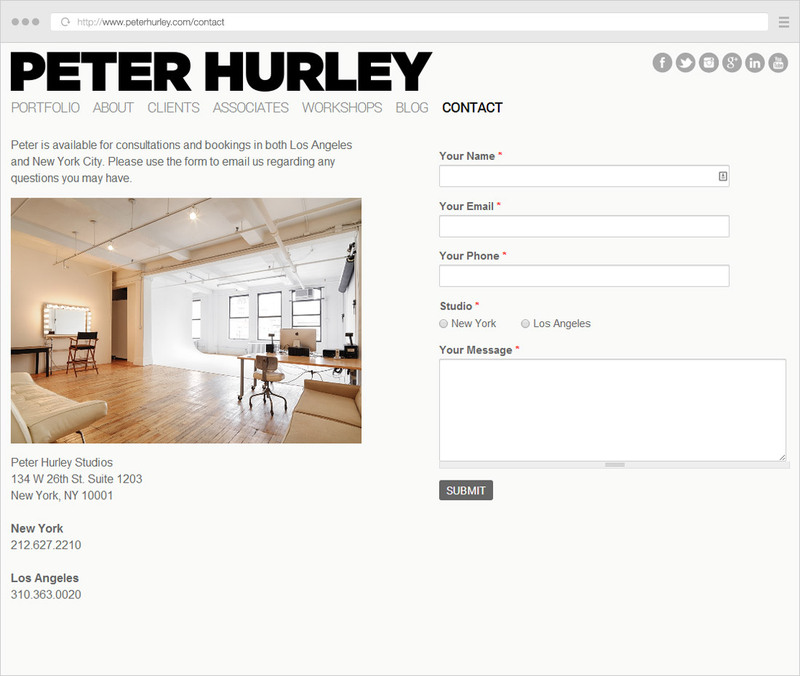 The good: nice & clean design, contact numbers in the footer throughout the site, “Contact” last in the menu. The not-so-good: no email address, no “tel” links for phone numbers, too many (required) contact form fields, somewhat distracting slideshow. 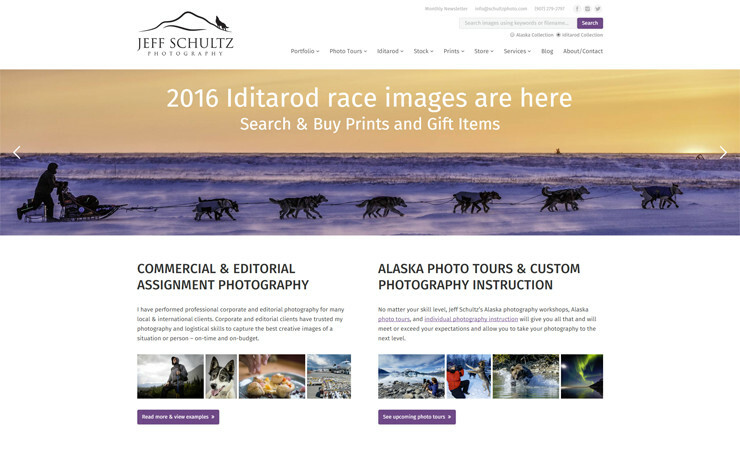 Read the entire article for an in-depth view of what you can do today to improve your photography Contact page (along with example/screenshots of how other photographers have done it well). Blogs also have huge SEO benefits, but most importantly, they create a more personal connection with your audience. 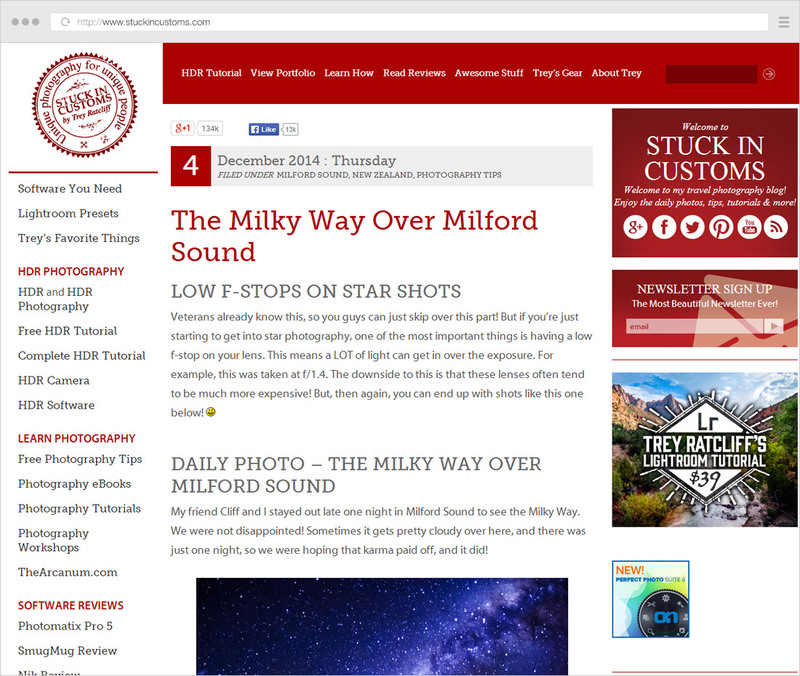 When you’re regularly publishing new articles and glimpses into your recent photography projects, visitors will trust your website more and keep coming back for updates. And Google will follow. PhotoShelter’s excellent “Photography Blog Handbook” is all you need to get you started blogging (covering topics like blog platforms, SEO tips, knowing what to blog about and examples from successful photography bloggers). 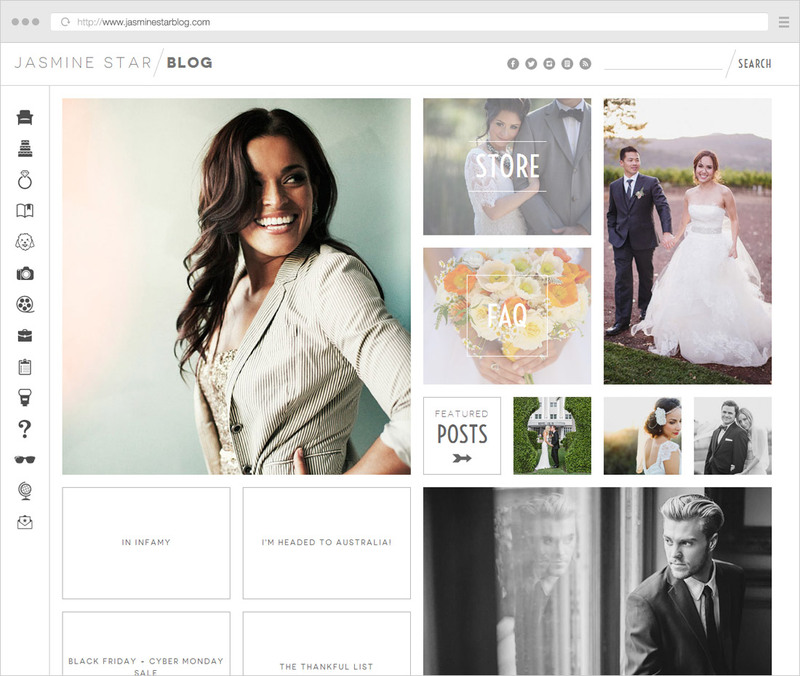 Jasmine separated the blog area from her main site, but this way created a more creative blog with unique navigation. 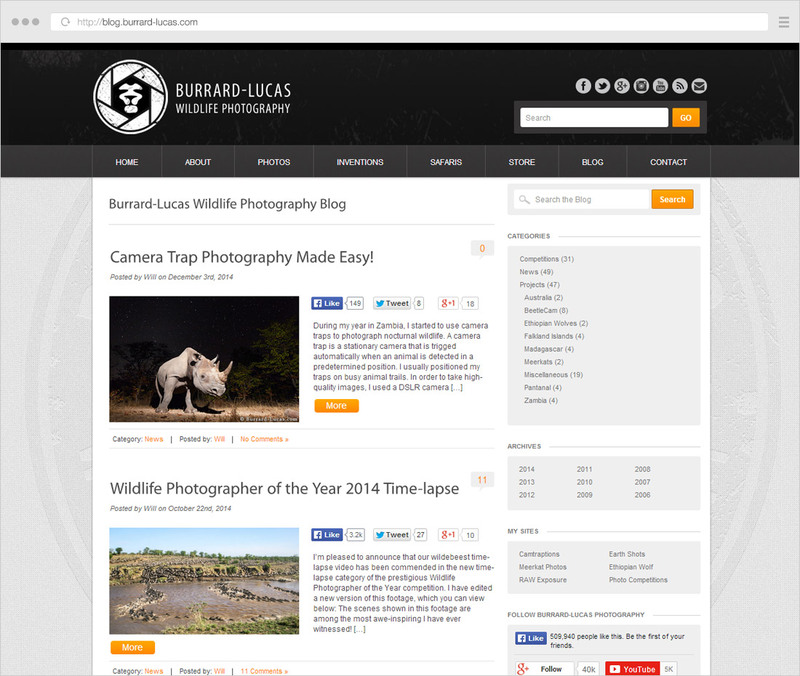 A more straightforward approach to blog page design, Burrard-Lucas has post excerpts on the left and useful widgets in the sidebar on the right. There’s no top photographer out there who’s not using some analytics software to measure traffic to their website (with Google Analytics being the popular option of course). Notice your bounce rate is too high? Try to add clear calls-to-action on main pages and make sure your navigation is easily accessible. See a traffic spike on certain days? Figure out where that traffic came from or try to replicate that type of content. Know people are doing image searches on your site? Track internal image searches to then add/promote more of the same. Want to optimize your site more? Try to learn more about your audience demographics to then better tailor your site content for them. Often being the second most visited page on a website, the Bio page is critical. 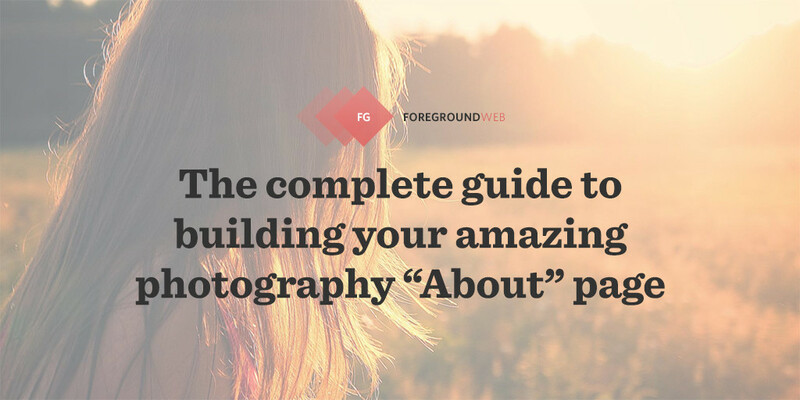 Successful photographers have learned to pay special attention to this page and have written their bio in a clear and concise way (along with a self-portrait of course, or a creative video with tools like Animoto). Although simple at first sight, the process of writing something about yourself can be quite challenging, not to mention knowing what other elements to put on the page and how to optimize it. Building a strong brand identity for your photography business requires something distinctive. In today’s flood of amateur websites, you have to make an effort to be unique. This can be done by better understanding your audience and by catering your message to them. But it also has design implications. Regardless of your message, if visitors see your site and think “Blah, I’ve seen this before!”, that critical first impression is lost! Going for a bespoke design from a quality designer can really set yourself from the pack. This is surely the most professional option. Based on your business goals, a “tailored” photography website can be much more effective than using existing themes/templates. But even if you’re using a website theme to save some time or money, you should still put in some effort to personalize it as much as possible. 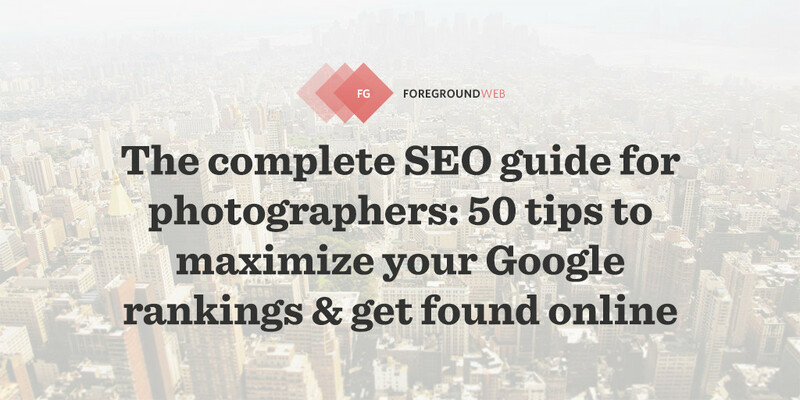 ForegroundWeb helps photographers worldwide with professional design and development services, SEO, consultancy etc. 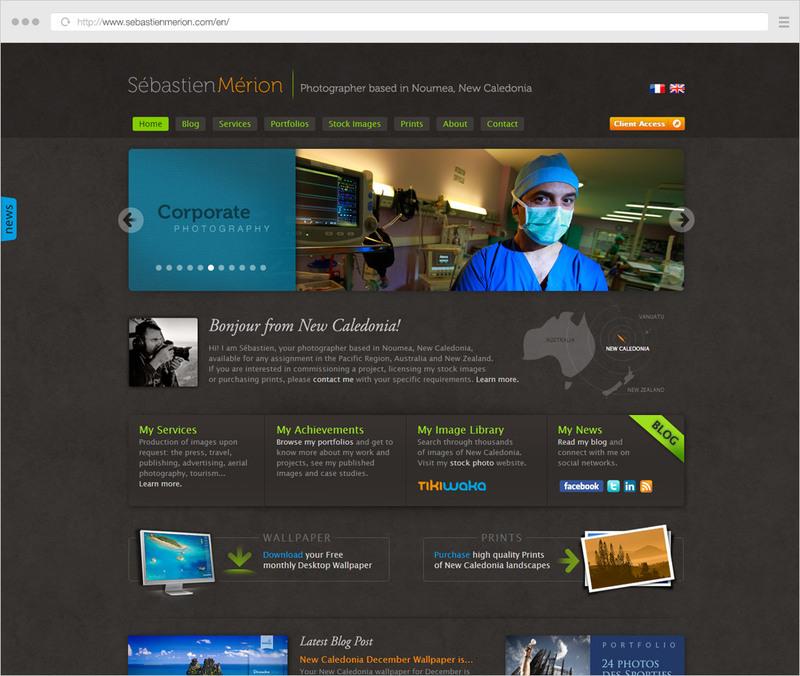 Visit the “Web-design” page for a list of all the web-design services, or contact me for a free quote. 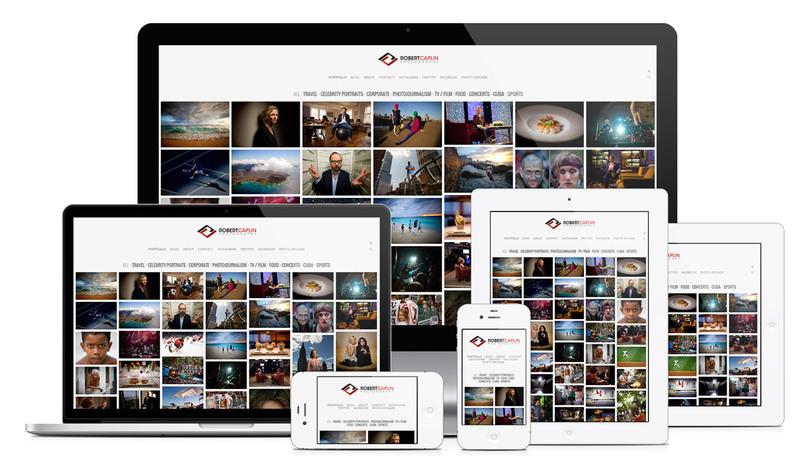 A common problem photographers face is with the quality of their hosting provider. The website is either slow to load (even with many performance improvements) or has frequent server hiccups (preventing visitors from loading the site for a few minutes/hours). If you’re using WordPress, I can strongly recommend WP Engine, I’ve had a great experience with them in the past. Successful website owners pay attention to both on-site and off-site SEO. 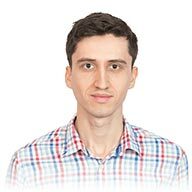 The on-site info (title and meta description tags, headers, image captions and keywords, etc.) needs to be in a perfect state, so that Google can then properly index the site and attribute value to its rankings based on the specific content/keywords on the page. Off-site SEO is more of a long-term strategy, mostly involving getting other sites to link back to you site (with good “anchor texts” if possible). 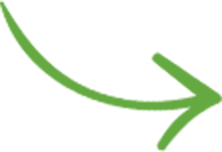 If you haven’t embarked on a strategy to create backlinks (e.g. linking to your site from social media and community profiles, blogging about your website, getting other people to blog about you etc), then you won’t have much success with search engines, and therefore you won’t have many visitors. You should think of each link as an endorsement of your content. The more links, the more the search engines are likely to consider you a credible search result. Differentiating yourself through SEO tactics alone is nearly impossible. In this day and age, trust is the name of the game. Using natural language and showing glimpses into your life are great ways to add personality to your website. Your photography About page is obviously a great opportunity to be creative (see notes above on “About pages”). But showing your personality on a site can be very difficult when you’re trying to follow various rules/guidelines. You’re reading a lot of things like “you should do this…, you should do that…”, so you might feel you’re working within narrow margins and don’t have room to really express yourself. I totally get that, I’ve felt overwhelmed like that many times in my career (both as a designer/developer, and also when starting in photography). Awareness is important: the goal is not to follow some rules blindly, but to understand and selectively apply them while still being yourself! Content curation is a skill you really need to master if you want to reach an elite level. That means learning to let go of your mediocre content, and just sticking with your absolute best images (even if you think they’re too few to matter). You should edit down as much as possible, and only promote the things you’re proud of. Don’t fill in gaps (with “average” content) just for the sake of it. So be conscious about the number of images in your slideshows or the number of featured galleries on your homepage, and only promote your best work. Oh, and don’t forget that the order in which you sort images (in slideshows or portfolios) can also impact the way they’re perceived. 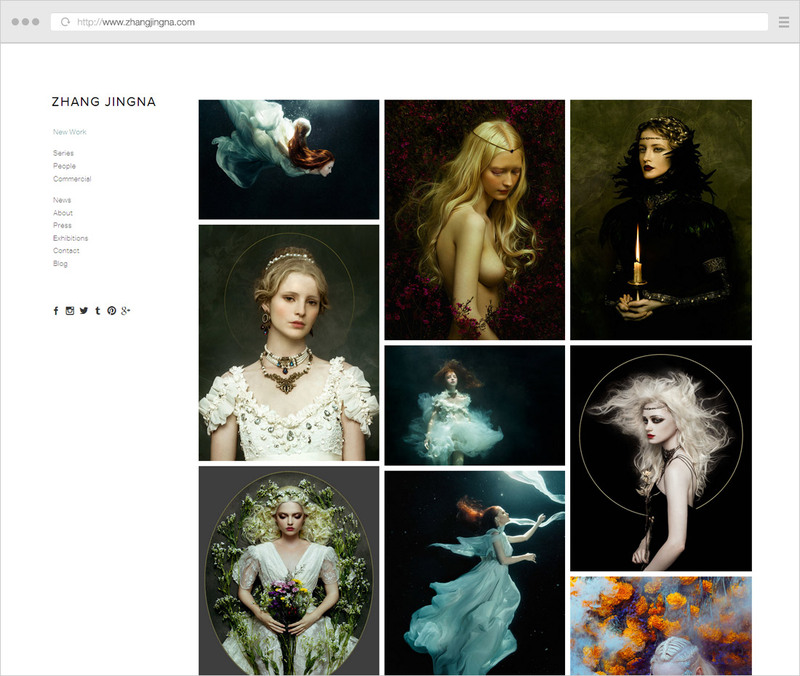 Jimmy builds each portfolio/gallery with a reasonably small selection of his top images. 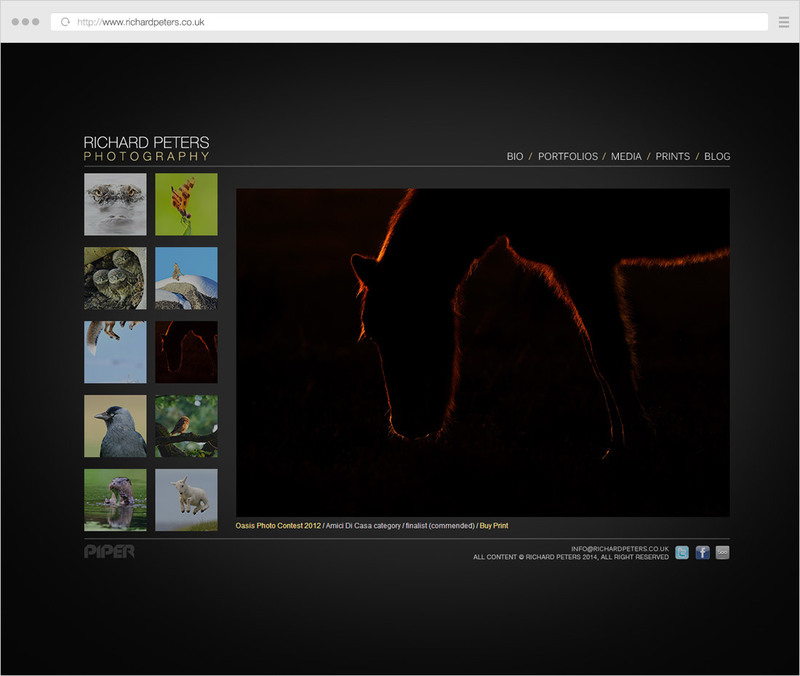 Richard carefully displays just a small selection of his best images. Top photographers regularly keep adding quality content (images, articles) to the site because they’re successful and they have the time/money/connections/opportunities to do so. But the reverse is also true: they’re successful because they consistently keep adding content. Trey reached such an impressive social media following (8 million followers on Google+ alone) by consistently adding quality content to the blog. Even if you feel your work is not good enough, even if your blog posts aren’t too long, even if you feel it’s not worth it anymore, keep pushing through. When you’re down, what you’re feeling is inner resistance or a fear of failure. Learning to push past them can do wonders for your self-confidence and the quality of your work. Mobile browsing is huge these days, you can’t ignore it any longer. In fact, mobile-friendliness is now an important ranking factor for Google. That means not forcing mobile users to pinch-and-zoom in order to navigate through your site. And that’s where responsive design comes into action, allowing your site’s content to properly adapt to any screen size, creating a much better browsing experience. 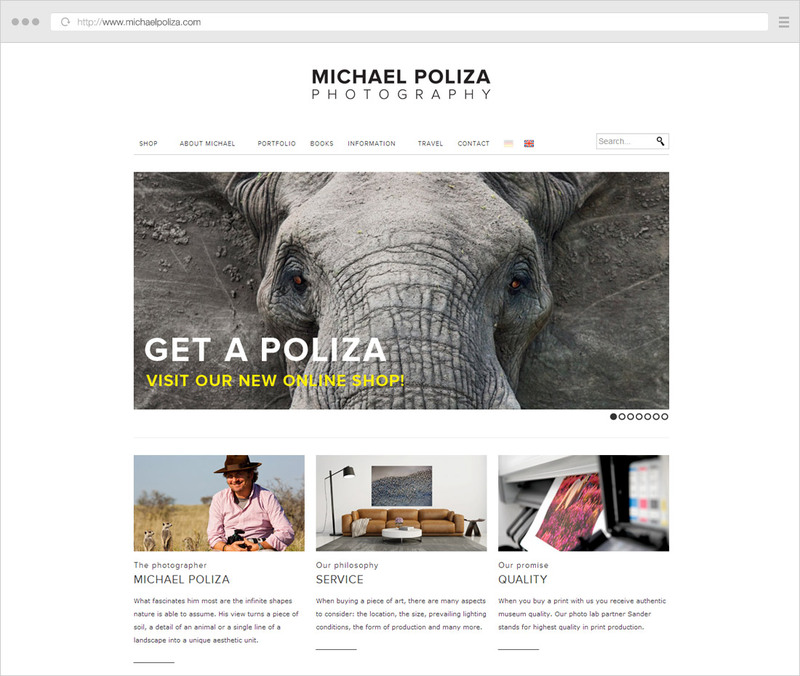 For photography website, this plays an even bigger role because users need to interact with the site more (to change slideshow images, to purchase images etc.) 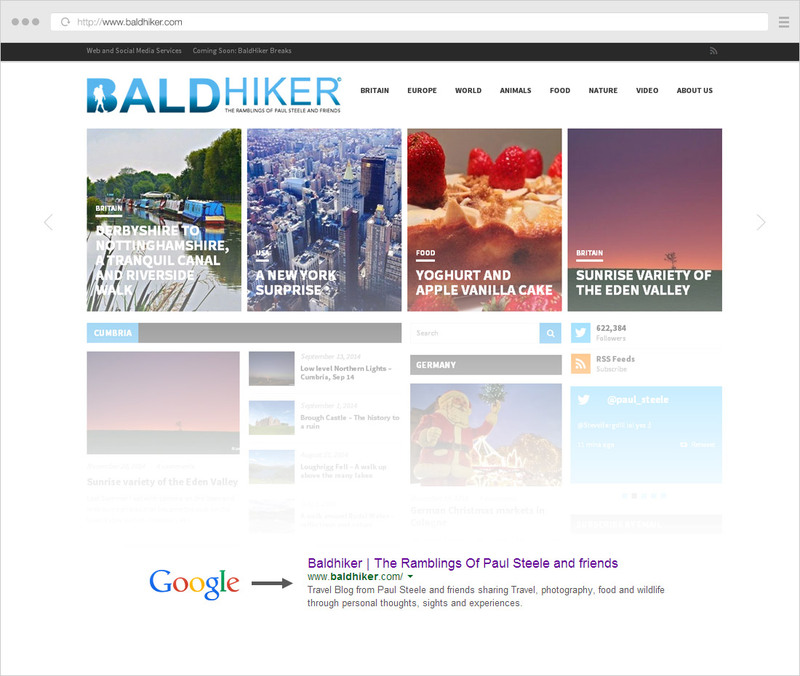 Great websites handle that well, resizing images/content as needed. And speaking of modern mobile devices, serving high-quality (“retina”) images is also slowly becoming the norm. You should definitely make sure your website is responsive, you can’t afford to alienate a good chunk of your visitors. Ever seen a top photographer not leveraging social media sites to expand his/her empire? First of all, let’s make the distinction between share/like buttons and profile links. Everybody has share buttons (to act as “social proof” and/or to allow visitors to share the site on their own profiles). Profiles links point instead to your own social media profiles. These act like “outposts”, outside of your site, helping you spread the message out into the online world. All successful photographers have surely found this to be very powerful, and are investing their time and energy (and sometimes even money for advertising) into growing their social media followers. This is a whole new ball game, and requires a lot of work. The “Photographer’s Social Media Handbook” is a great place to get you started. 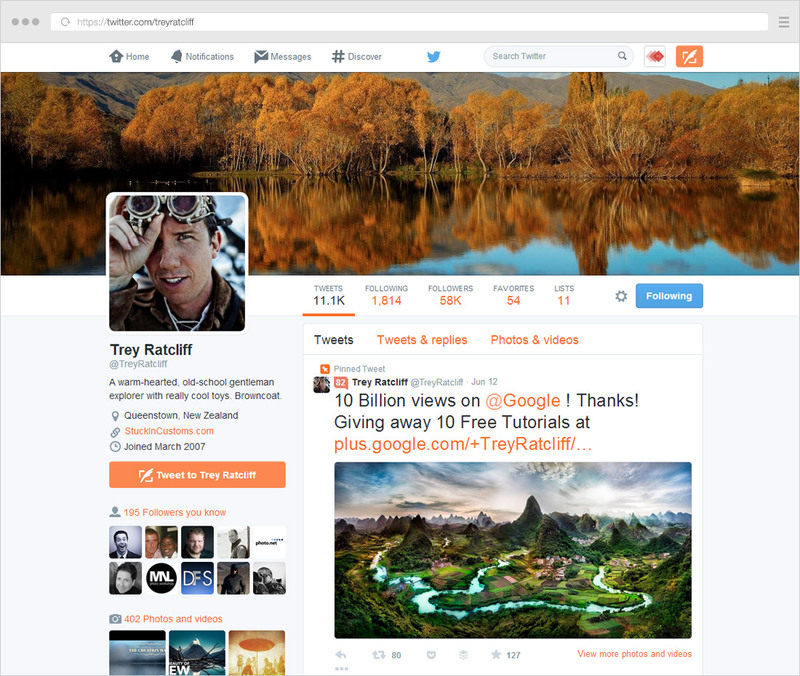 Trey Ratcliff is doing pretty well on Twitter, but nothing compared to his 8 million followers on Google Plus. Yes, 8 million! 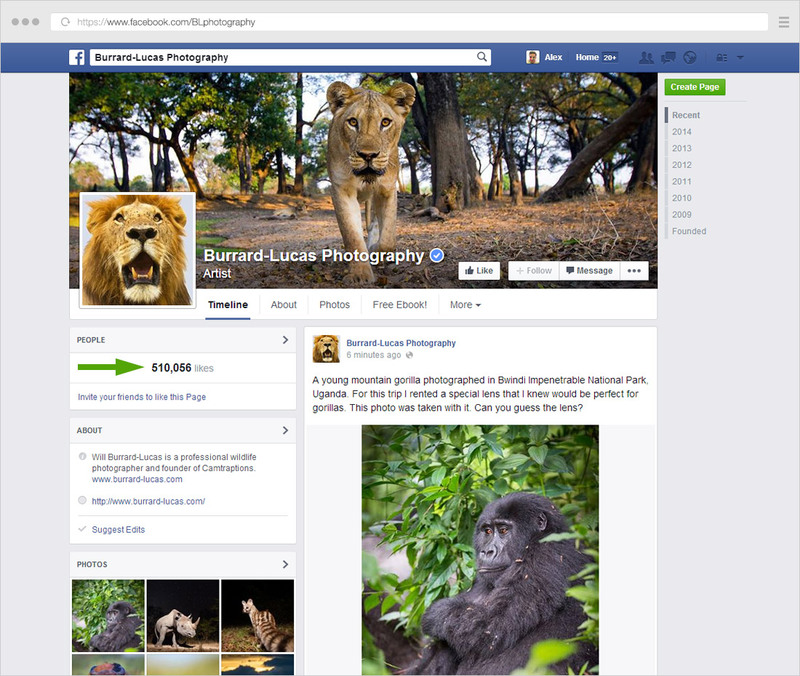 Facebook is still the best way to help spread your content, and many top photographers are properly using it. Almost all influential photographers leverage email marketing, it’s one of the best ways to build trust and deliver content to their fans. But this is harder to grow than a social media following, because it requires adding frequent posts and regularly providing value to your subscribers. And even though the number of subscribers you have is much lower than your Facebook likes or Twitter followers, the “audience” is a lot more targeted: they are people who chose to subscribe, so they like your work and want to see more of it. I’m personally using MailChimp, it’s probably the most powerful and well-designed email newsletter service out there, and it’s available for free (up to 2000 subscribers, but still cheap afterward). MailChimp generates the newsletter subscribe box embed code to put on your site, it’s really simple to set up. If you’re just starting out with this, learn some best practices and be sure to include unsubscribe links to your email campaigns (so your emails will end up in spam folders). 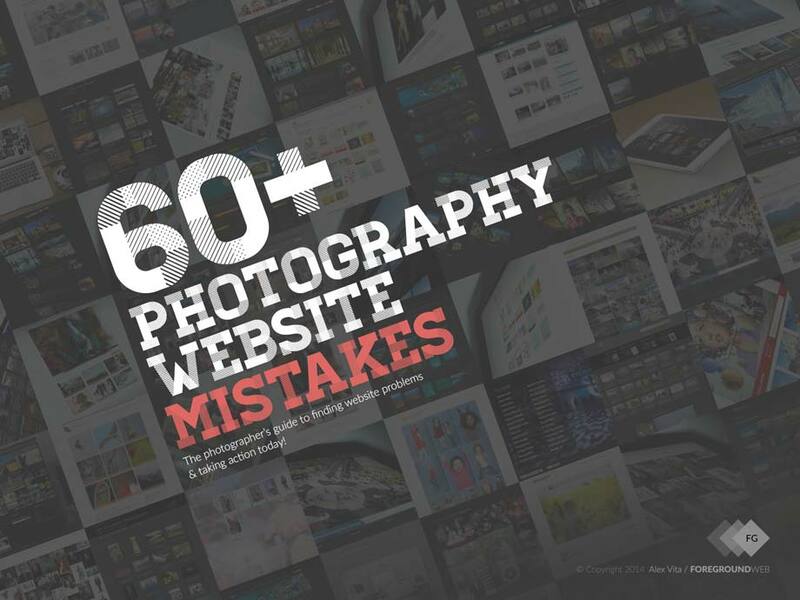 These are some of the most important attributes of successful photography websites. Trying to follow their lead and to reach the same level of website design quality, will surely raise your business to the next level. But don’t forget that the photographers (behind these successful websites) also got there through hard work, through a continuous effort to go out there and take great images. Always keep focusing on the right things: images matter most. 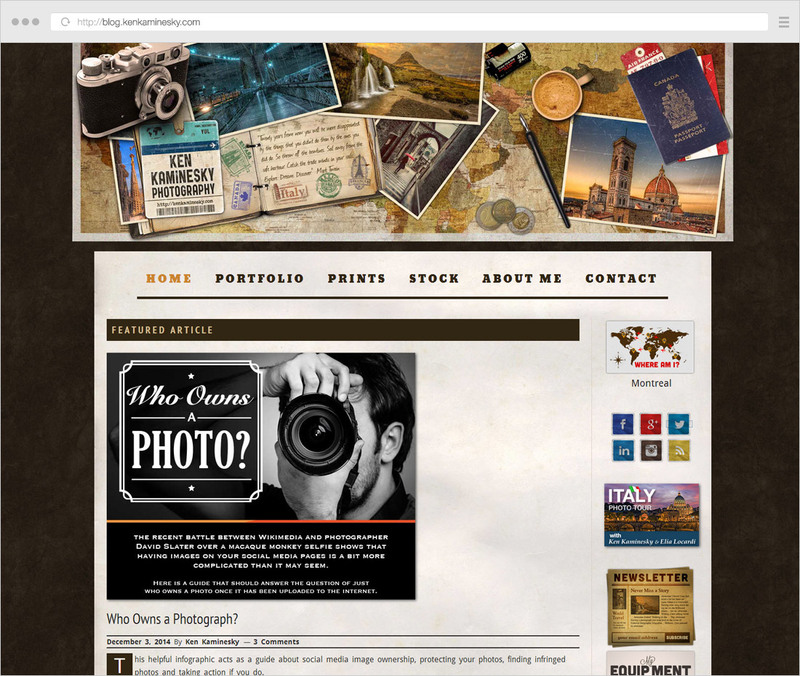 How can YOU start making your photography website more successful?